BALDWIN PARK >> Authorities Thursday released the identity of a Baldwin Park man shot by police after allegedly pulling a gun on an officer who was chasing him through an alley. James Anthony Teter, 23, was booked on suspicion of assault with a deadly weapon on a peace officer following his shooting and arrest just before noon Wednesday in an alley between Stewart Cutler and Stewart avenues, just south of Los Angeles Street, according to Los Angeles County booking records and Lt. Holly Francisco of the Sheriff’s Homicide Bureau. The shooting occurred as he was fleeing from a Baldwin Park police officer who recognized him as an AB 109 probationer wanted for violating the terms of his release, Francisco said. Teter allegedly pulled a handgun on the pursing officer, and the officer opened fire, striking Teter once in the arm. Francisco said Teter initially continued running, but quickly surrendered to the officer after being wounded. No officers were hurt. Booking records show Teter had already been treated for his injuries and booked into jail Thursday. He was released from jail under AB 109 post-release community supervision April 8 after serving a little more than three months of a 225-day sentence following convictions for resisting or obstructing police and violating his probation earlier this year, records show. According to Los Angeles Superior Court records, Teter’s previous convictions date back to 2010 and include domestic battery, drug possession, refusing a lawful police order, being a convicted felon in possession of a gun and auto theft. Teter was being held in lieu of $30,000 bail pending his initial court appearance, scheduled Friday in West Covina Superior Court. WEST COVINA >> A man died following a shooting in a West Covina parking lot late Wednesday, authorities said. The victim died at the scene of the shooting, which took place about 9:45 p.m. in a parking lot outside a U.S. Social Security Administration building along Vincent Avenue, just south of West Covina Parkway, West Covina police Officer Brian Kearns said. No information regarding the circumstances of the shooting was available, nor was a suspect description, he said. No suspects were in custody. HACIENDA HEIGHTS >> A jury Wednesday convicted a West Covina man of shooting a rival gang member in the throat last year, officials said. The shooter’s getaway was foiled when his bicycle chain snapped. A Pomona Superior Court jury deliberated for less than two days before finding Andrew Philip Kingsbury, 21, guilty of the May 14, 2014, shooting of a then-44-year-old Hacienda Heights man in the 1000 block of Olympus Avenue,” Los Angeles County District Attorney’s Office spokeswoman Sarah Ardalani said in a written statement. The jury convicted him of attempted murder and being a felon in possession of a firearm. “The defendant traveled to Hacienda Heights, spotted a gang member, walked up and shot him in the throat,” Ardalani said. The victim was hospitalized in stable condition, sheriff’s and district attorney’s officials said. Kingsbury tried to flee on a bicycle, but was soon apprehended after the chain on his bike broke, Thurlo said. Kingsbury faces up to 34 years to life in state prison when he returns to court for sentencing June 5, Ardalani said. IRWINDALE >> Los Angeles County sheriff’s deputies stood in 24-hour guard Wednesday over the site where fellow deputy David March was fatally shot during a traffic stop 13 years ago. Afternoon temperatures climbed into the mid-90s as deputies have continued the stoic tradition each year since March was gunned down along Live Oak Avenue, just east of Peck Road, on April 29, 2002. 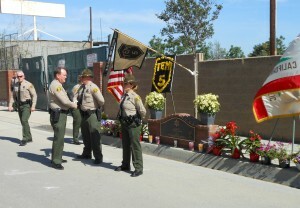 Sheriff’ Jim McDonnell visited the memorial site to pay his respects. March, 33, who was assigned to the sheriff’s Temple Station, was fatally shot after pulling over Jorge Arroyo Garcia, also known as Armando Garcia. After being captured in Mexico and extradited back to the U.S., Garcia pleaded guilty to the deputy’s murder in 2007 and received a life sentence in prison. 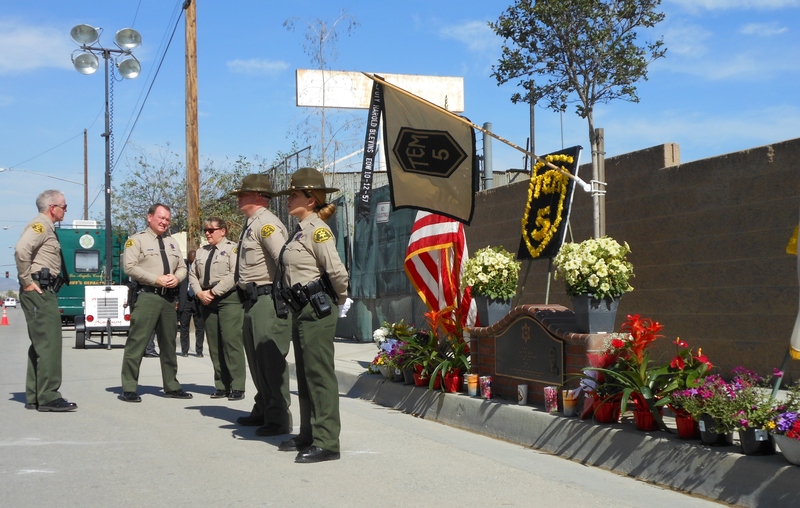 Two by two, deputies, primarily from the sheriff’s Temple Station, took turns standing half-hour shifts over the spot where March was fatally shot, which is marked with a permanent memorial plaque. After standing frozen in place for 30 minutes, deputies changed guards with a brief ceremony. BALDWIN PARK >> A police officer shot and wounded a man who officials say pulled a gun on the officer in a while fleeing through a Baldwin Park alley Wednesday. The wounded suspect, described as a 23-year-old Baldwin Park man, suffered gunshot wound that was not considered to life-threatening, said Lt. Holly Francisco of the Los Angeles County Sheriff’s Homicide Bureau, which is spearheading the investigation. The shooting took place just before noon in an alley between Stewart and Cutler avenues, just south of Los Angeles Street, Francisco said. The lieutenant said two gang officers spotted the man at Stewart Avenue, just north of Palm Avenue, and recognized him as a suspect wanted for violating the terms of his probation under AB 109 guidelines. The man ran, and one of the two officers chased him as he ran down an alley toward Cutler Avenue, she said. “During that foot pursuit, the suspect produced a firearm and an officer-involved shooting happened,” Francisco said. The wounded suspect was struck once in the arm and continued running west a short distance before surrendering to the officer, officials said. She said the suspect’s handgun was recovered at the scene. No officers were injured. The suspect was believed to a gang affiliate, Francisco said. Police and sheriff’s officials cordoned off the area as they conducted an investigation Wednesday afternoon. DUARTE >> California Highway Patrol officials are planning a free child passenger safety seat check-up event next week to ensure young travelers are buckled in properly and safely, authorities said. 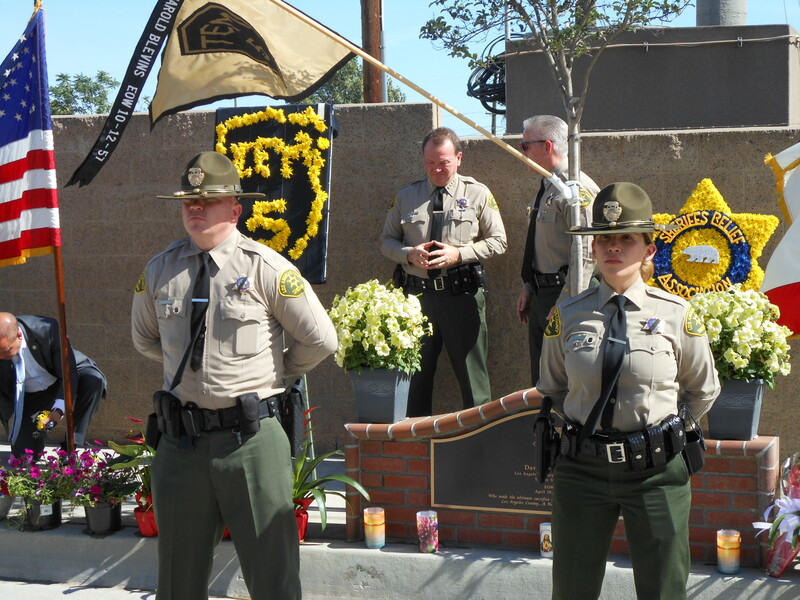 The CHP’s Baldwin Park office is hosting the event from 9 a.m. to q p.m. May 2 and Seidner’s Collision Center, 1000 Evergreen Ave. in Duarte, CHP officials said in a written statement. “Studies have shown child safety sears can reduce fatal injury by 72 percent for infants and by 54 percent for toddlers ages 1 to 4,” according to the statement. In addition to checking to ensure child safety seats are properly installed and offering traffic safety information, there will also be balloons, face painting and other surprises for the kids, officials said. The inspections are free, but by appointment only. 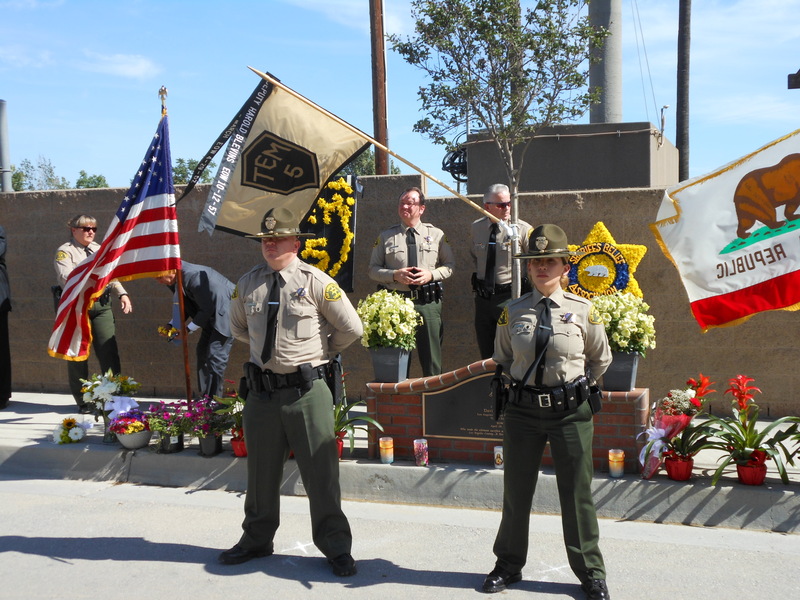 Appointments can be made by contacting the CHP’s Baldwin Park Office at 626-338-1164. Funding for the campaign is being provided by a grant from the California Office of Traffic Safety, through the National High Highway Traffic Safety Administration. BALDWIN PARK >> Two separate shootings in Baldwin Park left a man and woman wounded early Saturday, less than a week after another shooting claimed the life of a Baldwin Park man, authorities said. The first of Saturday’s two shooting took place about 1:15 a.m. in the 3200 block of Athol Street, Baldwin Park police Sgt. Mike Hemenway said. Officers responding to reports of “shots fired” encountered a man who had been shot in the buttocks, the sergeant said. He was hospitalized in stable condition. Just over an hour later, police received a 9-1-1 call reporting a shooting at Los Angeles and Walnut streets, Hemenway said. There, officers found a woman who had also been shot in the buttocks. Her injuries were also not considered life-threatening. The motives in both shootings were unclear, and detailed suspect descriptions were not available. It was not clear if the two shooting were connected. The attacks took place less than five days after the fatal shooting of Jacob Neftali Sosa, 37, of Baldwin Park. He died after he was shot about 8:20 p.m. on April 20 outside his home in the 3800 block of Cosbey Street, about a mile southwest of the scene of Saturday’s Athol Street shooting. LOS ANGELES COUNTY >> A highly trained team of more than 70 Los Angeles County firefighters stood by at the ready Saturday, ready to depart for Nepal to aid in rescue efforts at a moments notice, officials said. The Urban Search and Rescue team, known as Task Force II, is one of two in the nation qualified to go overseas to help in disasters such as the deadly 7.8-magnitude earthquake that struck Nepal, fire Capt. Roland Sprewell said. The other team of firefighters, known as Task Force 1, is based in Fairfax County, Virginia. Firefighters were “chomping at the bit” to help victims in Nepal, but had not yet received orders to deploy from USAID, Sprewell said. Meanwhile, they readied their equipment. “It looks like things are pretty much packed up,” Sprewell said. “That way, then it’s time to launch, all we have to do is go,” the captain said. Once the order is received, the firefighter-paramedics could be on a Nepal-bound airplane within hours. “This is what these guys train for,” Sprewell said. 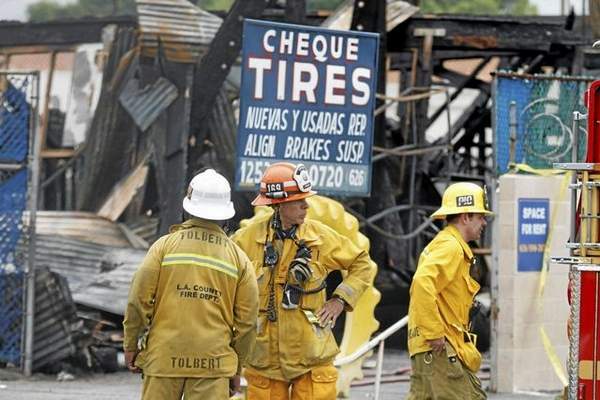 SOUTH EL MONTE >> Three people died and three suspects are being sought for a firebombing Saturday at a tire shop that also injured a firefighter responding to the blaze, authorities said. The alleged attack took place about 5:30 a.m. at Cheque Tires, 1252 Santa Anita Ave., Los Angeles County sheriff’s officials said. “We received a call from an informant that he saw three males throw a Molotov cocktail at a business,” Sgt. Jim Dexter said. Deputies and firefighters found the building “fully engulfed” in flames, he said. “Deputies and fire department personnel saw a man within the business compound and behind the heavily locked gates of the location, badly burned and trying to escape the fire,” according to Deputy Guillermina Saldana of the Sheriff’s Information Bureau. “Despite rescue personnel’s efforts to rescue the victim, he was overcome by flames and succumbed to his injuries,” she said. As the investigation continued, officials discovered to additional bodies inside the charred business Saturday afternoon, Deputy Ryan Rouzan said. The two additional victims were initially described only as adults. The deaths were being investigated as homicides. A firefighter suffered second-degree burns to his face while battling the fire, Dexter said. The injury was not believed to be serious. More than 65 firefighters worked for about 45 minutes to extinguish the flames, Los Angeles County Fire Department Capt. Brian Jordan said. They also rescued a dog from the property, which was turned over to animal control officials, he said. 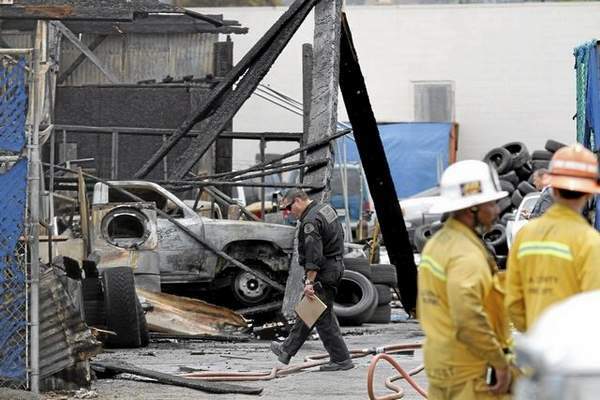 The suspects were last seen fleeing south on Santa Anita Avenue from the scene of the fire in a white Chevrolet Silverado pickup truck, sheriff’s officials said. No further suspect description was known. The victim’s name was not released Saturday pending positive identification and notification of his family, Saldana said. 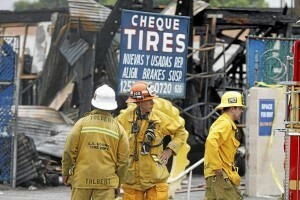 The motive in the fatal firebombing remained a mystery. Santa Anita Avenue remained closed to traffic as sheriff’s and fire officials continued working at the scene Saturday afternoon. SAN DIMAS >> Deputies are hunting for two men who robbed a Chase bank branch Friday afternoon, authorities said. The crime took place about 5:30 p.m. at the bank, 1001 Arrow Highway, Los Angeles County sheriff’s Lt. Tonya Edwards said. One robber entered the bank and handed a teller a note demanding cash as the second robber acted as a lookout, the lieutenant said. After obtaining cash, both robbers were last seen fleeing from the bank on foot, she added. No injuries were reported.